Over the last week, I've taken a box of Strawberry Delight Frosted Mini-Wheats to various homes and apartments to get an idea what people think of the new cereal. "It smells a lot like strawberry Starbursts (candy) - like scratch-and-sniff strawberry." "The strawberry flavor is very artificial." "It's super sweet... a lot sweeter than regular Frosted Mini-Wheats." "The strawberry sugar is very reminiscent of the frosting on a Kellogg's Pop-Tart." "It tastes like cardboard coated with strawberry Bubblicious (bubble gum)." "I wouldn't buy it again. It may be the worst cereal I've ever eaten." "It's kind of like if you poured strawberry milk over original Mini-Wheats... which is something I just wouldn't do." These comments seem a bit extreme, but the general tone of dissatisfaction with the strawberry flavor was universal. Certainly, the comments might be different if the respondents were talking to a relative or a friend in the comfort of a morning breakfast, as opposed to being confronted by large bald breakfast expert with a box of cereal and a shirt that says "breakfast". Personally, I don't think this cereal is quite as bad as some of the tasters made it sound. The "strawberry" is certainly more of a candy strawberry flavor than a nature-made berry taste. But let's face it: that's a norm in cereals right now. The freeze-dried strawberry pieces that have appeared in several cereals over the last three years have a more authentic taste. But the Frosted Mini-Wheats people went the other direction. Was it the wrong decision? Probably. I'd like to see them try a more natural approach and see how it goes. At its core, this is the Frosted Mini-Wheats we know with the same texture. But like a friend on dope, the personality of the cereal becomes unrecognizable when a potent new flavor is added. Kellogg's used to know the appeal of their original Frosted-Mini Wheats. It was part of their advertising for years. Frosted Mini-Wheats are cereal biscuits that are frosted on side and plain on the other. In the ads, the two sides would talk to each other. One side was silly and the other side was serious. In short, it was a cereal that appealed to people that wanted to eat a seemingly healthy breakfast, but still have some of the kid-like flavor fun that sugar provides. By beating us over the head with the artificial strawberry flavor, they've lost the personality of the original cereal. They've ignored what made Frosted Mini-Wheats special. The Bottom Line: If you're crazy about artificial strawberry flavor (some of us are), give this a try. Otherwise, skip it. Try original Frosted Mini-Wheats with fresh strawberry pieces. If you have to have flavored Mini-Wheats, go for the superior Maple & Brown Sugar Frosted Mini-Wheats. 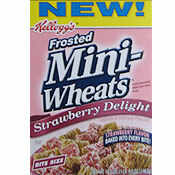 What do you think of Strawberry Delight Frosted Mini-Wheats? My Grandson has been eating this cereal for years but the last time said it tasted like rotten bananas (and he was correct) Did they change something? Instead of artificially flavored Mini Wheats, I'd rather eat real fresh strawberries sliced up in the regular Mini Wheats with milk. It is good that way and I am sure better for us. Moderation! Heh! We doon wan no stink'n moderation! This cereal is awesome! I've been having it for breakfast 5 days a week for the past several years and have not grown tired of it. Although, of late, I do note a slight change to the formulation, in that the awesome strawberry blast one would get when first opening the box seems to be significantly toned down. Perhaps it's just the current batch I'm working on - "Exp date MAR 07 2012 KPB 110A 01:35" I'll be watching you Kellogg's! Meh! I like the taste of artificial strawberry and strawberry milk so in other words anything sweet. This wasn't as sweet as others posted. Hope there's still some left here in stores. Kellogg's just introduced their new line of cereal. The biscuit is filled with mixed berry jam. This is a long awaited gem since they discounted the original strawberry version with fruit filling. Ewww hate them, taste like cardboard and the texture feels like soggy warms ewww!! I'm gonna stick with my froot loops and lucky charms. I never had the original but the commercial for the strawberry mini wheats was so catchy I just had to try them! First I ate one dry without milk. YUCK! But when I had a bowl with milk, it was no longer dry, it absorbed the milk and tinted it pink. Not too sugary, I like! In fact, I end up eating them for snacks all the time. The originals were the absolute best (with the real strawberry filling) but these are by all means adequate! Yum I love all mini wheats I don't care what flavor in fact, I'm eating them now. It's a great tasting cereal!! I love it either with milk on it or plain, I eat a bowl of it daily, just the right amount of sweetness, and a great strawberry taste to the cereal. In a way, it kind of reminds me of strawberry milk that I absolutely love too!!! God I love this stuff. It's my new face cereal right behind Honey Nut Cheerios. Now the Blueberry Mini Wheats on the other hand, yuk, don't even waste your time with that one. I've eaten boxes of this cereal and have never gotten sick of it. It's amazing. BEST CEREAL EVER!! don't listen to those negative comments. BEST CEREAL EVER. Well this is a first for me. I've never thrown out cereal before. I love frosted miniwheats so I noticed they now have strawberry and blueberry. I got a box of the Strawberry Delight and the second I opened the box, not the sack, but the box, I was yucked out by the distinct smell of strawberry Slim Fast! Yuck! But I forged ahead and tried it and it is awful. Honestly, I think this is the first cereal I've downright hated. I should have read the Mr. Breakfast review before buying it. I even resent they tricked me into wasting my milk on this horrid stuff. I hate this cereal! it tastes like paper! I haven't eaten cereal in about 10 years but more recently decided to try and get into the routine (for health reasons). I grabbed this box thinking I would ease into the healthy stuff by getting a medium healthy looking cereal. This stuff is GREAT! If you are on a health kick looking for a healthy-er snack or dessert after dinner this is perfect for both. Or, trying to ease into eating a more healthy breakfast this is one to start with. I may have found the perfect morning cereal! Two thumbs down to Kellogg's. Pretty good cereal... I like the plain best... but these are pretty good overall. I make them and I'll never get sick of them. I love them. I absolutely love this cereal and I eat it all day long. In fact, I am writing a persuasive speech telling my class they should all eat it too. Also, they are the only semi-sweet cereal you can get with WIC vouchers. This cereal is sweeter than regular mini-wheats, but I love it. It reminds me of drinking Nestle strawberry milk when I was a kid - really sweet, very artificial, but somehow delicious. If you do not like sweet artificial strawberry flavor, this cereal might not be for you, but its one of my favorites. As a shredded wheat enthusiast (I eat it a minimum of once a day), I can say that this is definitely a flavor more focused for the kids. To me it tastes great because it reminds me of my childhood days sipping on strawberry milk. This is probably my second favorite flavor of s.w. just after the vanilla creme. I think it's great! I love this cereal. I think it's mega-yum! The worst cereal I've ever had. 4 thumbs down. They are awesome!! To me, they taste like strawberry milk, which I love. I couldn't imagine a kid turning down this cereal. This cereal made me love breakfast again! It's good for you, it's sweet and it's filling. Also, the strawberry milk at the end is fantastic! I agree with the original comments - candy flavored. I bought a box for my daughter and she ate one bite before telling me that they were all mine. I find it easier to eat if I add bananas. I was thinking of trying to incorporate them into a bread recipe to get rid of them. Strawberry Mini Wheats are the best! I find that if you eat them with water they dont get so dry. They are amayzing and sweet i love em. MINI MINI MINI MINI WHEATS! This cereal is damn near sold out everytime I go to Vons (Safeway for some of you folk). I don't know who you talked to about this cereal, but I'm never trusting they're opinion again. I'm pretty sure the Strawberry Frosted Mini-Wheat character on the television commercial is Jewish. When told he has 'crunchlettes' he replies (with a Jakie Mason -like inflection) "I have cruchlettes?" I think the strawberry flavor is very good. I looked at the middle of one that is split open and it looks like a poptart! I like this cereal. This cereal is the BEST thing to ever hit our supermarkets... it gives us the best of both worlds! Good Healthy Snack and PERFECT for sugar cravings! This is my favorite snack cereal! It is too sweet for actual breakfast, but any other time I love it! This cereal dances on my tongue. And plus I love the commercial where one shoulder mini wheat hits on the other pink shoulder mini wheat but it turns out the pink one is a male shoulder mini wheat. haha gotta love it. These Strawberry Mini Wheats are amazing. Not too sweet and really yummy! I am not a cereal person but this I love! We just got them here in Canada in January 2007. I am not sure if they are exactely the same, they are called mini wheat strawberry flavour. I found them not too sweet. I am usually very picky about cereals but I actually liked them and would buy them again. Kellogg's used to have Stawberry Mini Wheats, which had stawberry filling instead of frosting, they were DELICIOUS....Here in Canada kellogg's have reintroduced them about a year ago but are now called All bran strawberry bites.....Yummy they are my favourite! I love this cereal. It is my soul purpose in living; its amazing blasts of strawberry goodness produce an orgasmic effect in my mouth. This is probably the first cereal that I can actually finish the whole box myself (over time) and not get sick of it before it is gone. Oh my God, this stuff was DISGUSTING. Even my kids wouldn't touch it. Agreed: This is the nastiest cereal ever. How did it get out of the lab? Way too sweet and artificial. I couldn't even finish the bowl! They gave me a stomach ache. I was extremely disappointed in this new cereal. 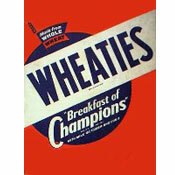 Kellogg's used to have Stawberry Mini Wheats, which had stawberry filling instead of frosting, they were DELICIOUS!. This new flavor is crap compared to the old kind. This is the best cereal ever made. It's like God is rubbing your tummy. I just came back from the store with 4 yes FOUR boxes of the strawberry Frosted Mini-wheats. We eat them like candy, and with milk... it tastes like Strawberry quick... Or better yet, its like the took the strawberry and cream lifesavers and put them on whole wheat. Its like whole wheat crack!!!!!!!! As Im writing this letter I got a box sitting next to me on my desk, all my co-workers LOVE IT!!!!!! My daughter and I just love em... Cleveland stores cant keep it in stock, thus the LARGE purchase. I have to STRONGLY disagree with Mr Breakfast! I love the original mini wheats and the new strawberry ones! I strongly recommend this cereal! It is also a great snack to throw in a zip-lock bag and to eat it dry. The strawberry mini wheats are my new on the go snack! Maybe some adults out there will think its too sweet, but if their kids like things such as "Frankenberries" (which are sweeter) but they want their kids to have a healthier cereal they should try this one. I love it! I actually really like the new Strawberry flavor. I like to just eat them as a snack without adding milk. They are a big improvement from original mini-wheats. I would definitely buy them again! I must be on crack, because I love this cereal. Maybe because I grew up on (stuff) like Cap'n Crunch and Trix -- but it's nice to have a whole grain cereal that tastes like the super sweet stuff I love. :-) I'm on my second box... and I guess if no one else loves it as much as I do, I'd better stock up.